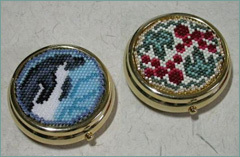 Flat round peyote panels 1 & 5/8” have many creative uses: pillbox, accent charms, key chains, & ornaments. Joan shares a leaping dolphin detail taken from her new book. My grape design fits the pillbox too, but it also makes a unique accent charm for a leather bottle tote. *ArtCraftWorld is no longer in business.